There are many reasons why millions of us will be tuning to watch the returning “Downton Abbey” this evening on PBS. Even my snootiest of “non-television” friends were transfixed with the rollercoaster drama provided by last year’s season 2, which became the most-watched series ever for Masterpiece. More than 17 million viewers tuned in across its seven episodes. Seasons 1 and 2 together have won nine Pimetime Emmy Awards and a Golden Globe for Best Mimi-Series. 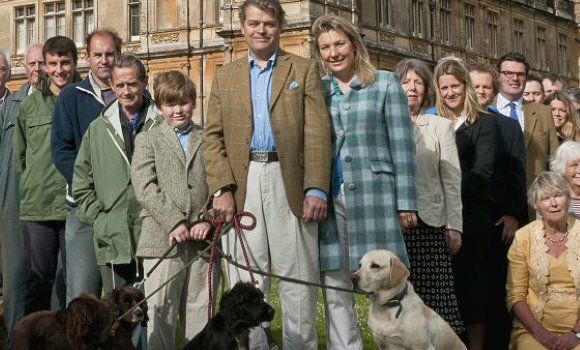 If you’re a fan, stay tuned to ARThound for an interview with Lady Fiona Carnarvon, the down-to-earth duchess who actually lives at Downton Abbey (Highclere Castle). She was a practicing accountant when she met her husband, Geordie, in 1996 and, in 2001, they took over the tenure of Highclere Castle, Berkshire, becoming the eighth Earl and Countess of Carnarvon. Of course, she talks about meeting the program’s newcomer, Shirley MacLaine, who spotted some paranormal activity at Highclere Castle while gearing up for her performance as Martha Levinson, Cora’s (Elizabeth McGovern) liberal American mother, who trades some heated barbs with Violet (Maggie Smith), the prim Dowager Countess.